“Harvey,” currently playing at Illinois State University, captures the spirit of playwright Mary Chase’s 1944 Pulitzer Prize-winning gift to a world worn down by war. We sometimes feel worn down, too, and this warm, wise, chuckle-inducing play still has a lot to offer. Robert Quinlan directs this production, staged on a breathtakingly gorgeous turntable set by Kim Lartz, lit by Nick Chamernik. Jack Hradecky couldn’t be better as the loose-limbed, sweetly affable Elwood P. Dowd, who has no desire to be a “normal human being” and decided long ago he’d rather be kind than smart. Elwood is extraordinarily content with his life as he makes his daily rounds at the local taverns, accompanied by his best friend, Harvey, who he first encountered leaning against a lamppost. Harvey is a 6-foot-3½-inch-tall white rabbit. Elwood calls him a pooka, an invisible fairy spirit in animal form. Elwood can always see Harvey, some of the other characters can occasionally see him, and as for the audience seeing him, well, that’s to be determined. Dowd’s live-in sister Veta (a funny, dithery Abby Langner) and her social-climbing daughter Myrtle Mae (Casey Iwanski) have had it up to here with Harvey. Elwood’s loopy ways are interfering with their social life and there’s nothing to do but have him committed to Chumley’s Rest, an asylum. Turns out things are pretty loopy at the asylum, too, and it’s Veta who gets admitted after she tells Dr. Sanderson (Christian Frieden), who is charge of admissions, that she herself has occasionally glimpsed Harvey. Frieden and Nurse Kelly (Deanna Stewart) do a fine job with their antagonistic but romantic subplot even though it feels a bit dated to modern ears. The plot looks to take a tragic turn as the forces align to give Elwood a shot that will take away his infectious good cheer render him “normal.” Hopefully that big rabbit has a trick or two up his furry sleeve. 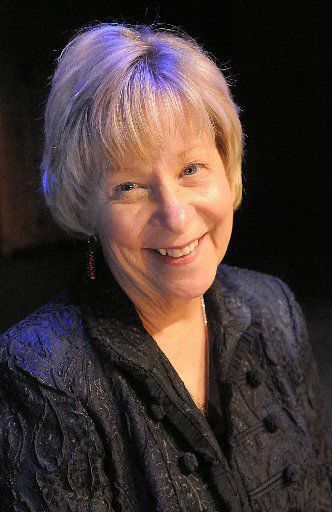 Nancy Steele Brokaw is a freelance writer who reviews plays for The Pantagraph.